I’ve been trying to make time here and there for the K12 Online Conference 2009, which is just finishing up after a two-week run. I know the conference never ends (great tagline) but I feel as if I need to be engaged now, as it unfolds, or I lose the threads. I’ve expressed concern to the K12 folks (who should be commended for all the work they do to pull this together — it’s an amazing array of resources and entry points) about the confusing path of multiple platforms of the conference, and no clear point where participant should enter the discussions with presenters. Do I add a comment at the K12 Online Blog? Or the K12 Online Ning? First, I need to find the K12 Online Wiki to get the schedule … etc. I think the Ning is the way to go but I suspect that it is blocked in a lot of school districts with filters. I just know that I was and remain confused at times (some presenters put their work on the Ning; some, not.) about where my voice belongs. That said, there are some amazing resources in the K12 Online Conference this year. Here are a few that I engaged in during the past two weeks. Little Kids, Big Possibilities by Kelly Hines: This was a great way to show how technology tools can be used even with younger students to engage them. Kelly lays out a few possibilities (I ended up using Wallwisher the same day I saw her presentation). I liked the way she walked the viewers through steps and rationale. The iPod Touch in the Classroom by Kern Kelley: I think 201o will be the year of mobile devices in the classroom, but I worry it be because it is tech on the cheap as opposed to tech that makes sense for the classroom. Kern gives us an overview of some of the possibilities with the iTouch and each day, it seems, more and more apps are being shared by teachers that have learning possibilities. Using E-Books to Motivate Pupils Writing by Colin Hill: Colin explores the ways that online publishing can transform writing and engage young writers in meaningful ways. I expressed some concerns about sites with no advertising, but if you teach young writers, this presentation is definitely worth your time. Plus, some of the student samples that Colin shares are so darn cute and engaging. Options for Building Your Teacher Website by Cyndi Danner-Kuhn: This is a good primer for teachers who want to create a web presence but are not sure how to begin or where to go. At this point, I think, most teachers should have some digital footprint for their class. I guess that is my opinion, but I know, I am frustrated that I can’t even glimpse the work being done by my own kids because their teachers are doing nothing online. You Might be a 21st Century Leader if… by David Wells: David’s message is for administrator, so I felt like a spy from the teaching ranks in the back of the room. I made the comment that David’s assertion that all administrators realize that the world is changing may be wrong. Some, but not all. And teachers experience this reality when they run into walls around filtering and access and professional development. You may want to send this presentation to your principal. Keeping the Literacy in 21st Century Literacies by Drew Schrader: How can you resist that title? Drew brings us into some tools of the Web (screentoaster, prezi, etc) and tries to remind us to keep a focus on the literacy that these tools can enhance. Don’t get caught up in the tool so much that you lose sight of the learning. This is a message I try to keep rambling through my head. To Those Who Want to Rock-Don’t Suppose Compose! by Carol Broos and Carol Vrotny: Ahhh. Music. I liked that there was space here for bringing the composing process into the mix of teaching, and these two colleagues explain the rationale for music teachers to embrace the tools that move students from listener to composer. Nice. The Digital Writer’s Workshop by Jackie Gerstein: Jackie brings us into her classroom to see how she has integrated technology with her students. I loved the scene where her kids are interviewing the developers of Tikatok books via Skype. Just think how empowered those young writers must have felt as they peppered their virtual visitor with questions. Using VideoAnt Annotations to Provide “Audience-Based” Assessment to Students’ Video Productions by Richard Beach: This was my first view of VideoAnt (thanks to Gail P. for giving me the heads-up on this one). It seems like an intriguing way to help students engaged in video work by making notes right on the video itself. But, it seems to me that this won’t work for me because the video files have to be in a place like YouTube, and I use Vimeo. I’ll keep exploring, however. OpenSim: Open Learning by Timothy Hart: I started this presentation and then got caught up in other things and need to get back. I am intrigued by how gaming and open source can be used in the classroom, and Tim seems to know his stuff. Steal this Preso: Copyrights, Fair Use, and Pirates in the Classroom by Mathew Needleman: Matt always creates interesting presentations and this one is no exception. He explores the world of fair use in the classroom and reminds us to consider the legalities of teachers and students using the work of others in the digital world. 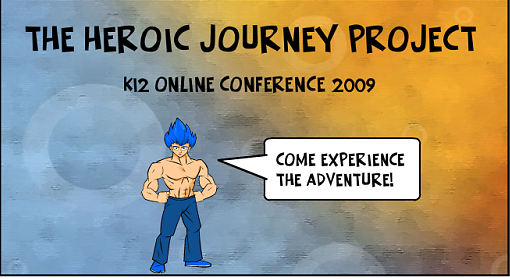 Have you journeyed into the K12 Online Conference? What have you explored? Sometime later today, my short presentation for the K12 Online Conference will go live. It’s called The Heroic Journey Project and I tried to show how my students used Google Maps, Google Earth and Picasa for creating an online heroic journey across the world. You can check out the K12 Online Schedule and also visit and participate in the K12 Online Ning site. There are some wonderful presentations there already. When my preso goes live, I am supposed to create a forum discussion at the K12 Ning and ask three essential questions to spark a discussion among folks, so I am trying to think about that and also am hoping I can post all that this morning before school starts. The K12 Online Conference is about to begin today. Here is a PDF flier and here is the link to the schedule of presentations and keynotes, etc. It’s a great way for teachers to learn about technology and education from the comfort of their home. I just got news this weekend that I was selected to be one of the workshop presenters for this year’s K12 Online Conference. Actually, the news filtered out through my network earlier in the week but the official email arrived in my box yesterday. I am part of the “Kicking it up a Notch” group. My presentation is about the Virtual Heroic Journey Project that I do with my sixth graders after they read The Lightning Thief and a graphic novel version of The Odyssey. We use Google Maps and Google Earth to develop their own creative writing assignment in which they are somewhere in the world and must make, like Odysseus, their way home by encountering and battling a series of obstacles and monsters. So I admit: I had forgotten that I even submitted an idea to the K12 Conference. When my friend, Matt, congratulated me via Twitter, I had to check and see what he was talking about. Doh. This is the second time I have presented — the first time was in a great collaboration with Bonnie around our Collaborative ABC Movie Project that connected teachers around the world as we explored digital storytelling through the concept of an ABC Book. What’s cool about the K12 Online is that it is free, it is full of interesting presentation, and it is archived forever. Just go to the homepage and you can see links to presentations for every year. Neat.